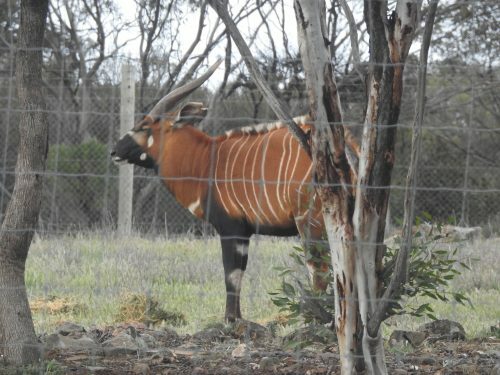 Earlier this week I posted here on this site an article about a recent visit to Monarto Zoo in South Australia. This zoo is not much more than about 15 minutes drive from my home in Murray Bridge. It forms a part of the great collection of animals in the Adelaide Zoo. I am a member of both so I try to visit the zoos on a regular basis. 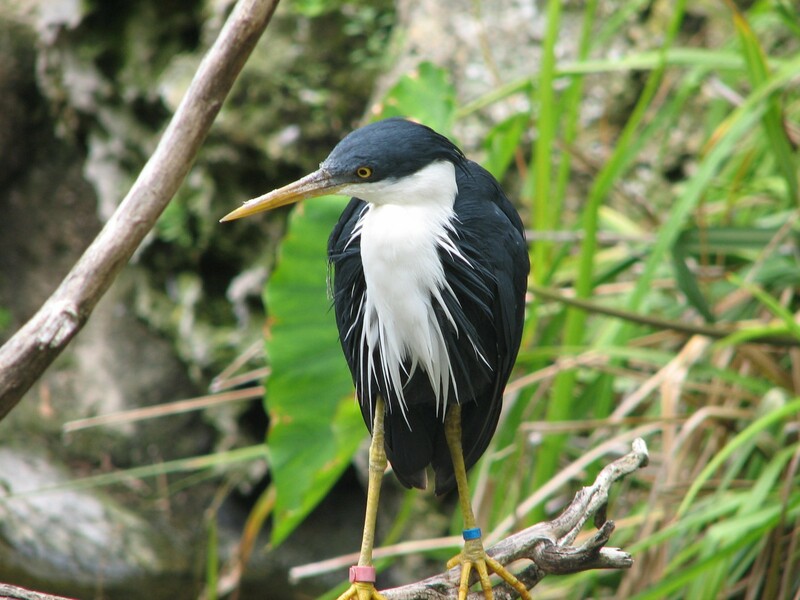 On this last visit, I not only saw a nice list of native birds which inhabit this open range zoo but I also managed a few good photos of many of the animals which I have decided to share today in this post. One of the features of Monarto Zoo is that it is an open-range zoo. All of the larger animals are in open paddocks through which visitors are taken on a guided bus tour. The zoo used to be a farm, but the fenced enclosures now keep in exotic and Australian animals, not sheep or cattle. 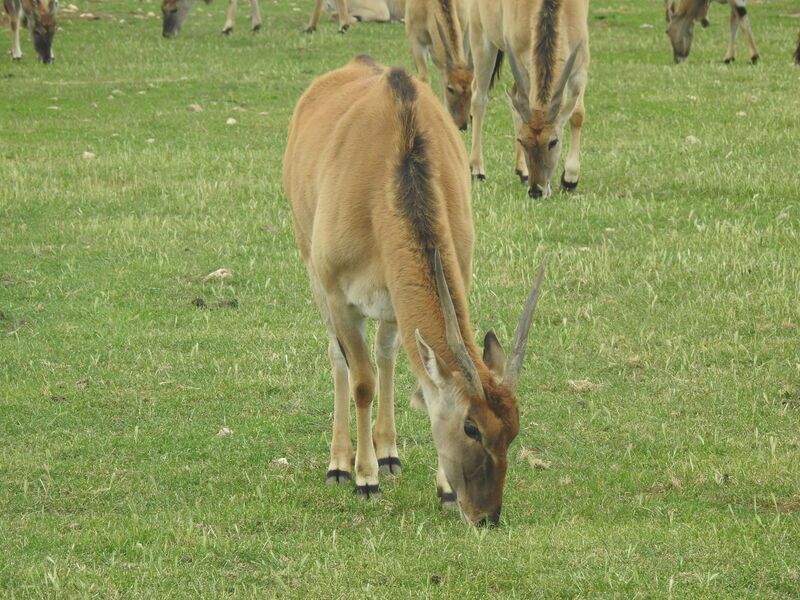 Some large sections of the zoo are natural scrub, areas which were never cleared by the original farmer. 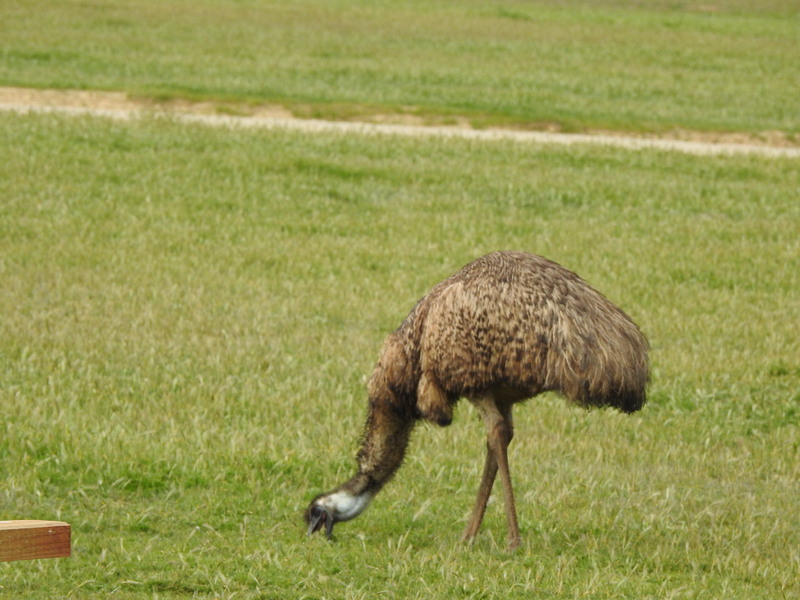 Some species native to this region remain trapped inside the zoo, species such as grey kangaroos, emus and the echidna shown in the photo above. 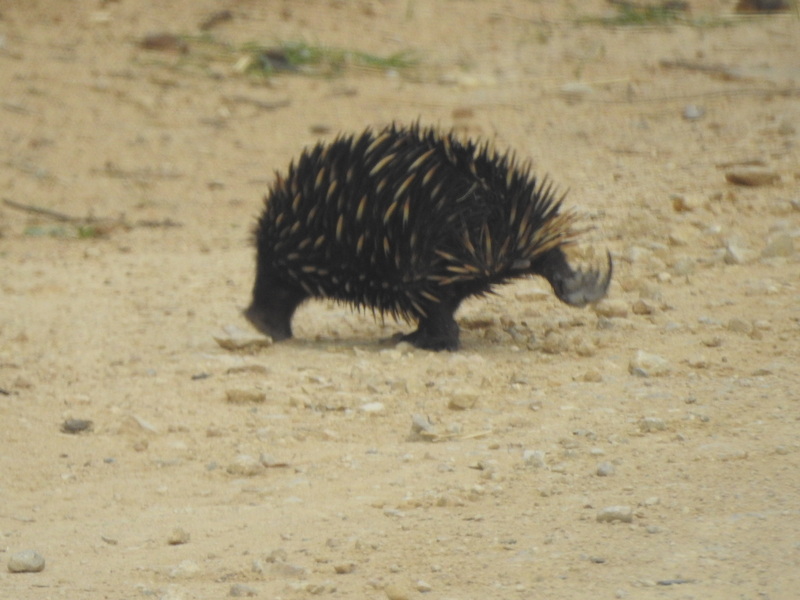 This little fellow smartly crossed the road while the tour bus was parked so that visitors could get off or on the bus. While the echidna is widespread in this region, in my experience one does not come across one very frequently, possibly because they are largely nocturnal. It was good to see that the species is alive and well in the confines of the zoo. From time to time I also have one come to visit my garden. Over recent months there has been quite a number of baby animals born in Monarto Zoo, including the adorable Cheetah cubs shown in the photo above. 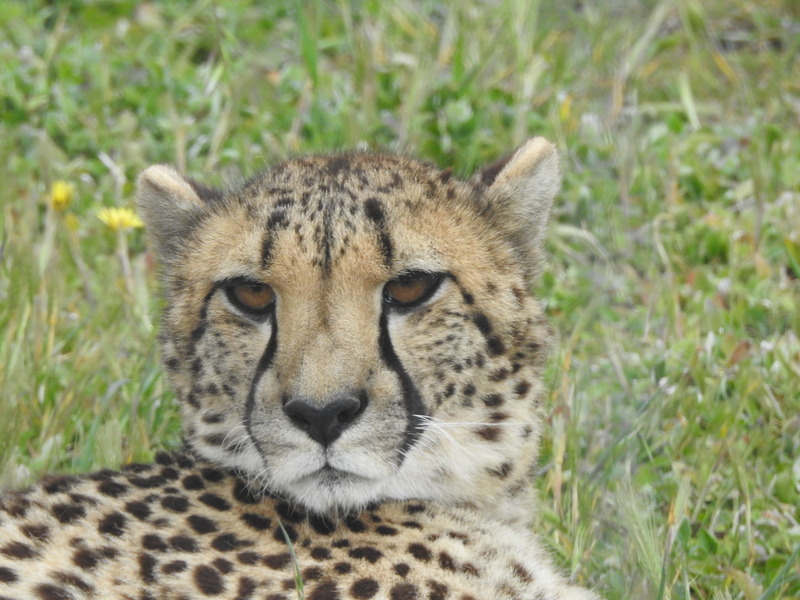 I also managed a good portrait shot of the mother, shown below. 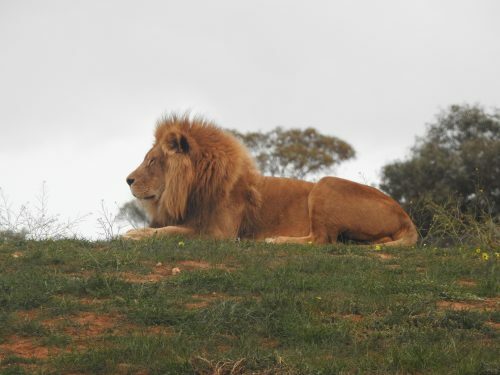 The magnificent male Lion shown in the photo above is actually sitting on top of a human enclosure. 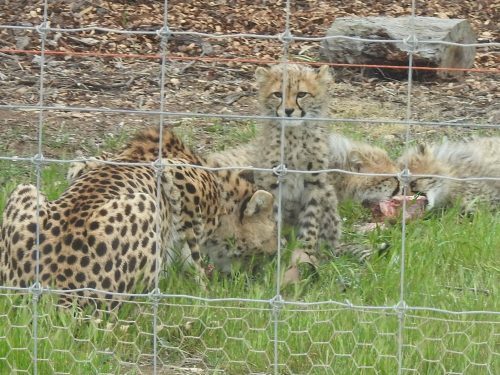 For an extra fee, visitors to the zoo can enter this ‘cage’ and experience the Lions up close – and visitors can feed the lions meat through the grill of the human cage. I haven’t yet taken advantage of this experience but I plan to do it sometime later this year. It should be awesome. My last photo today is of one of the Yellow-footed Rock-wallaby. No guessing how it got its name. 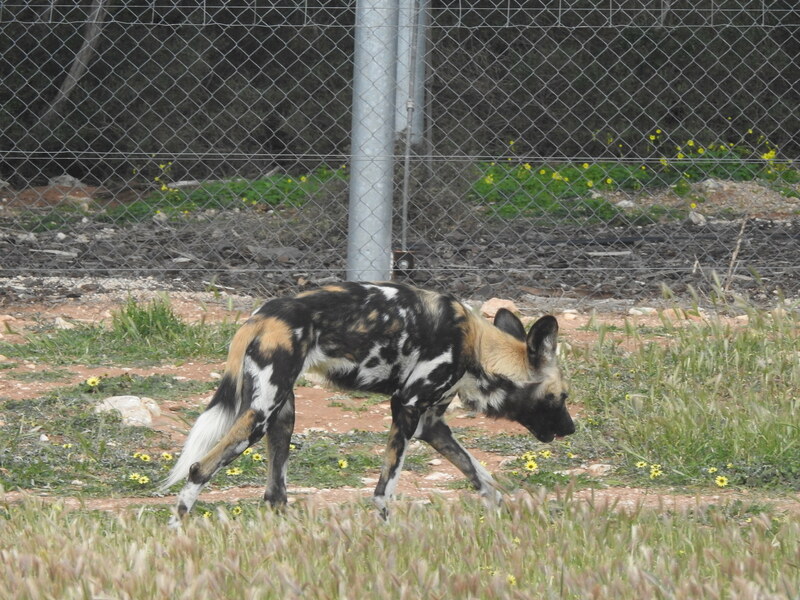 This species can be found in the more remote parts of South Australia such as the Flinders and Gawler Ranges. I have seen them in their natural environment but that was many years ago. I hope that you enjoyed the photos. Please leave a comment about your encounters with any of these species. I was just getting over Christmas and then WHAM! New Year hits us and now I find that a week – a whole week – of 2014 has gone by without me wishing all my readers a Happy New Year. Someone please slow down the clock – or add another month or two to the calendar. I need an extra few weeks/months in every year to get done the things I plan to do. Many years ago I had a Calvin & Hobbes cartoon pinned up near my desk at work. The caption read: “God put me on Earth to achieve a certain number of things. Right now I’m so far behind I am going to live forever.” I feel that way right now – and have frequently felt it over recent years. So with no further ado, let me wish all of my readers a HAPPY NEW YEAR. One of the hindrances to not sharing anything new here recently has been the peaceful passing of my mother-in-law. It has meant a flurry of activity, including a rushed trip home from Sydney where I’d hoped to have been out birding a little more. Mum’s funeral was a celebration of the great things about her – not the hardships and ill health of recent years. It was also a time of gathering together family and friends to remember the good times with much laughter. I’d better get around to telling you about the birds I’ve seen recently. 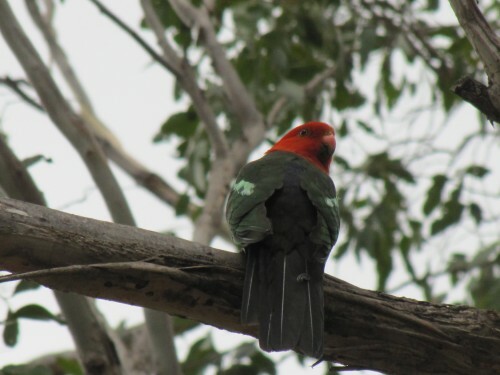 One species I longed to see in my son’s garden in Artarmon was a King Parrot. Even my 5 year old grandson can identify that one because it is a frequent visitor to the garden. Sadly none made an appearance while I was playing with the children during our three week stay. On a brighter note I did see about 4 Australian King Parrots during our day-long visit to Mt Annan Botanic Gardens at Campbelltown in the south of great Sydney. The light conditions were poor – very overcast – when I tried to photograph them, and the photo below is the best of a poor lot. At least you can see that it is, indeed, a male King Parrot. 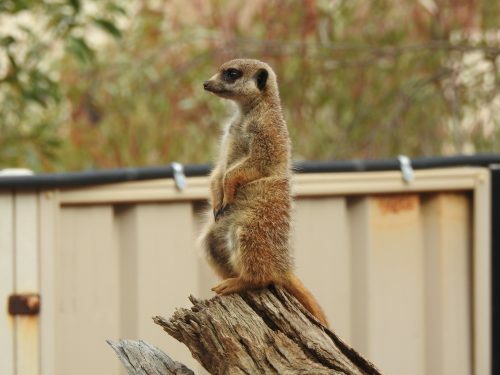 The photo at the top of this page is one of my favourites and was taken in one of the walk-through aviaries at Adelaide Zoo here in South Australia. 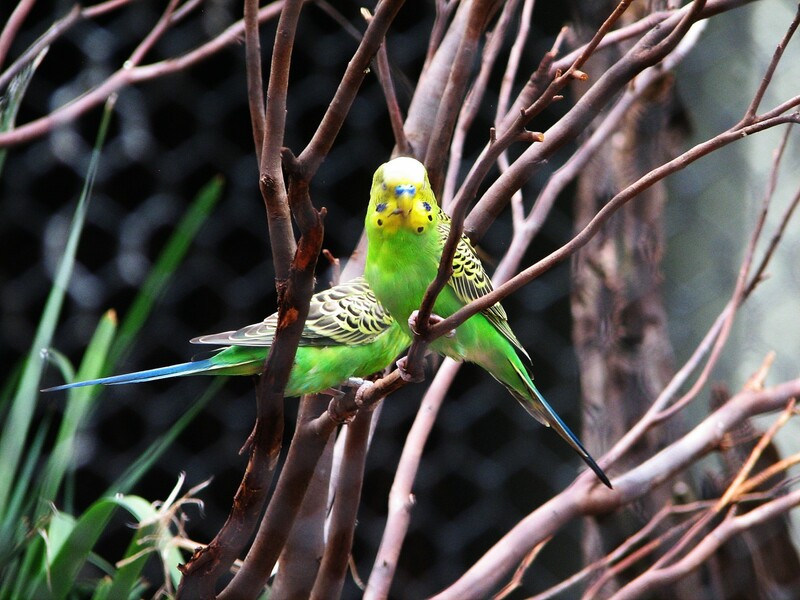 I am quite pleased with this photo of two budgerigars. 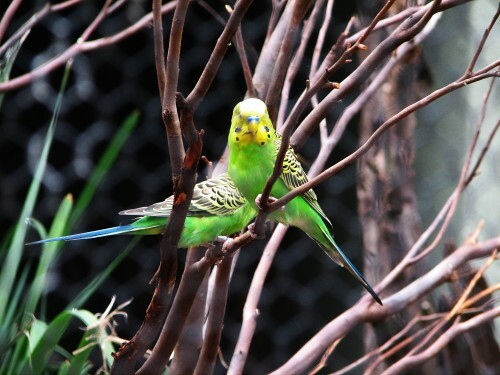 It was taken through the wire netting of one of the aviaries in the Adelaide Zoo here in south Australia. The viewer is not even aware of the netting between my camera lens and the birds. Budgerigars, probably the most kept pet bird in the world, is truly magnificent in its natural colours and in its natural environment. 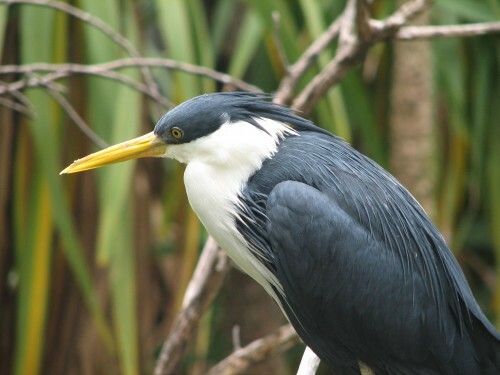 I know breeders of this species have developed all sorts of amazing colour variations: yellow, blue, purple, white, speckled and even red – though I suspect the photo of a red one I found online was actually of a bird dyed that colour. Why mess with beauty and perfection. The natural colours are just perfect. We have many colourful parrots in Australia. In fact, our land is aptly called “The Land of Parrots”. 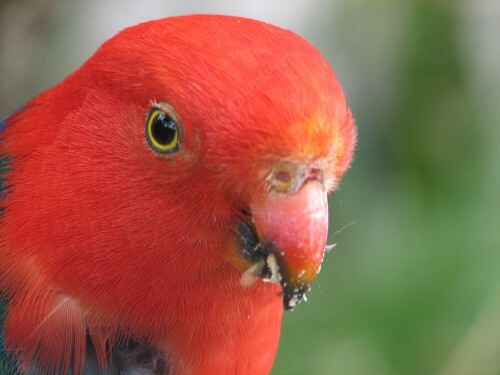 One of the more colourful parrots native to Australia is the King Parrot. Sadly, I’ve only seen this species on a handful of occasions. I should spend more time visiting my grandchildren in Sydney because my son tells me that they often fly through or spend time in their garden in Artarmon. I’ve missed them every time I’ve been there! 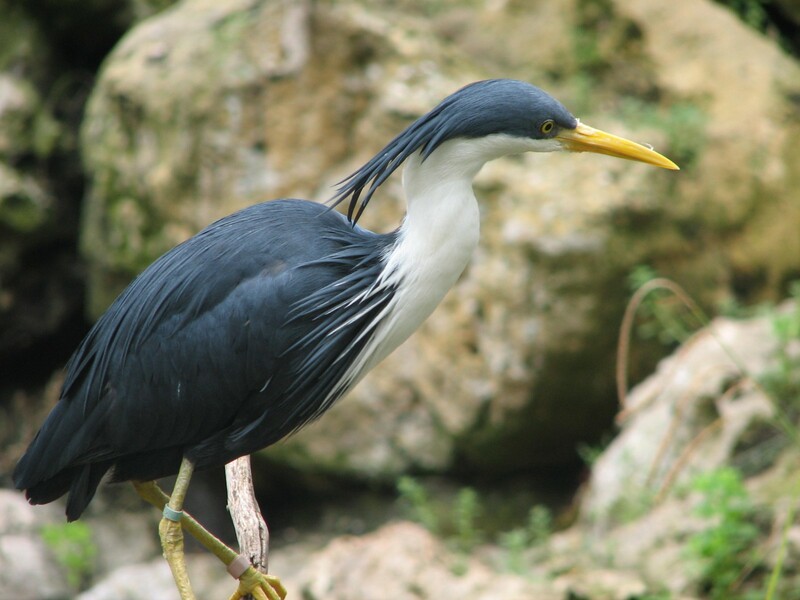 The bird shown in today’s photo is up close and personal. It was easy to get this photo because it was taken in a walk through aviary in the Adelaide Zoo. Moreover, the keeper had just fed the birds and it was more interested in eating than what I was doing. Added to that was the zoom facility on my camera. Nice shot, I reckon. What do you think? Leave a comment or two, please. When I look at the photos I am posting today I cannot but help being amused. That’s one very interesting hairdo. I’m not sure if one can draw that conclusion, however, seeing birds have feathers, not hair. 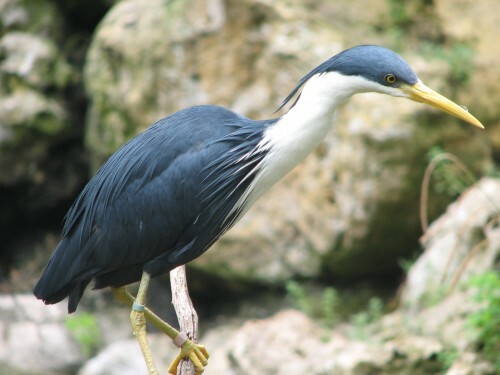 Still, the arrangement of the feathers on this Pied Heron amuses me and I hope my readers also have a little chuckle. Let me know what you think by leaving a comment or two. The bird featured in today’s photos is a part of the collection of birds in a walk through aviary in the Adelaide Zoo here in South Australia. 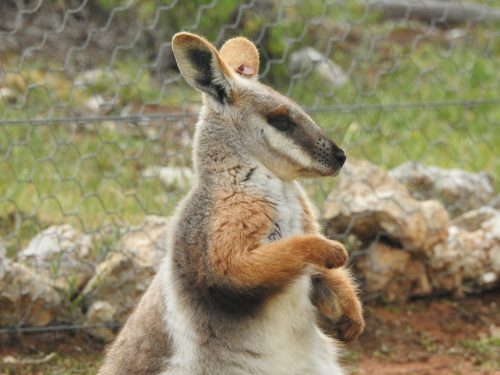 You are currently browsing the archives for the Adelaide Zoo category.